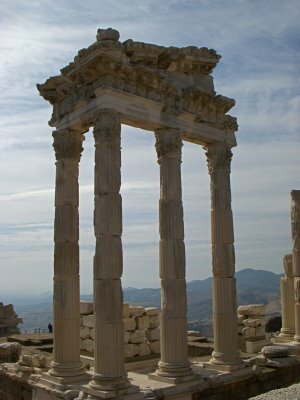 Heading out of Selcuk, I contemplated to visit Pergamum, conveniently, Gram was heading that way and we invited a couple from California that lived in Oman for the last 13 months. After visiting the site, Gram dropped us off at the bus station and I caught a bus to Behramkale. I can say, Gram, who is from England, is a very nice person, it worked out well to visit four different sites together. 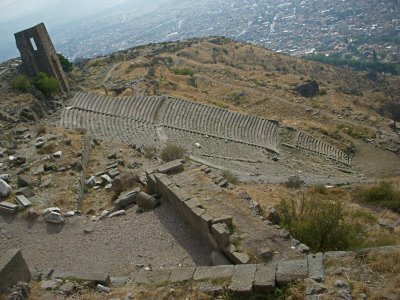 Pergamum was a small settlement during the Archaic Period. Lysimachos, one of the generals of Alexander the Great and who had become the sovereign of Anatolia after 301 B.C., delivered the war expenditure, at 9000 talents (1 talent is believed to be $7,500), to Philetarios who was the commander of Pergamum, and the kingdom founded by Philetarios by using this sum of money following Lysimachos’s death, flourished and became the most eminent center of culture of the Hellenistic period for 150 years. 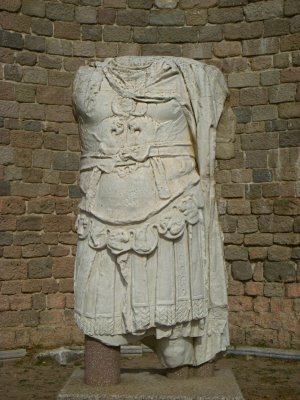 During the reign of Eummenes II from 197-159 BCE, Pergamum achieved its height of glory. Eumenes added the library and the Altar of Zeus, and many other building projects. The Altar of Zeus has the shape of a horseshoe, and its dimensions are 36 x 34 meters. It is composed of four parts and the high relieves on it describe the war between the giants and the gods. The Altar which was taken from Pergamum in 1871 and carried to Germany by the German engineer Carl Humann, and rests in the Museum of Pergamum in Berlin, and is set up to its original. Today Turkish government is trying to get it back from Germany bringing the issue to the international court. Pergamum was the home of three temples, the marbled columned Temple of Trajan which Hadrain finished. The Temple of Athena that was built just above the theater, and the Temple of Dionysus, which was built on the right side of the stage of the theater. 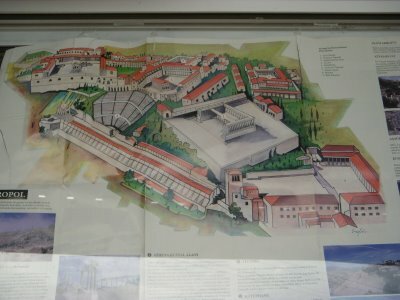 The above picture is an excellent reconstruction of Pergamum. 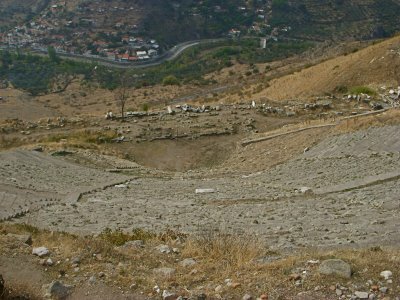 Notice the theater on the slope of the hill, just above the theater slightly to your right is the temple of Athena. The very top platform to your left is the temple of Trajan. Below the theater to your left is the temple of Dionysus, and to the right of the theater is the altar of Zeus that is in Berlin, Germany. The library held more than 200,000 volumes of books and challenged the worlds greatest library in Alexander, Egypt that held 700,000 books. When fire damaged the library in Alexander, Mark Antony pillaged the library at Pergamum. Today, in Alexander Egypt, the library is known worldwide, today in Bergama, no library exists. The theater is one of the steepest theaters built, and the steepest I have visited. The theater could hold 10,000 people, and was constructed into the hillside, a site that will impress the least interested individual. Previous post: A Development Update.